*A few setups needs to be performed for exporting time from Microsoft Dynamics 365 Finance and Operations. This section details the configuration process. Although this feature is not entirely dependent upon any parameters, you can export un-posted time as well then there is parameter to control that behavior. Posted timesheets – in case of Inter-company timesheets, where the Inter-company postings (customer invoice and Vendor Invoice) is not completed. Go to Projects management and accounting > Setups > Projects+ parameters > Timesheet tab. A new form to configure pay codes is introduced. This form may be used by any payroll system, which is external to Dynamics 365 for Finance and Operations. Pay codes are used for the grouping of hours while exporting the hours into the time export form. The users can validate if there are missing pay codes for the transactions available for export in the selected period. Borrowing legal entity Allows to select the borrowing legal entity. The default value in this field is the logged in legal entity. Project code The options available are – Table, Group and All. When set to group or table, the project relation must be selected. This field works in conjunction with the Project Relation field. Project relation This field is non-editable, when the option in Project code is set to All. The Project groups are displayed for selection when the Project code field is set to Group. The Projects are displayed for selection when the Project code field is set to Table. Category code The options available here are – Table, Group and All. 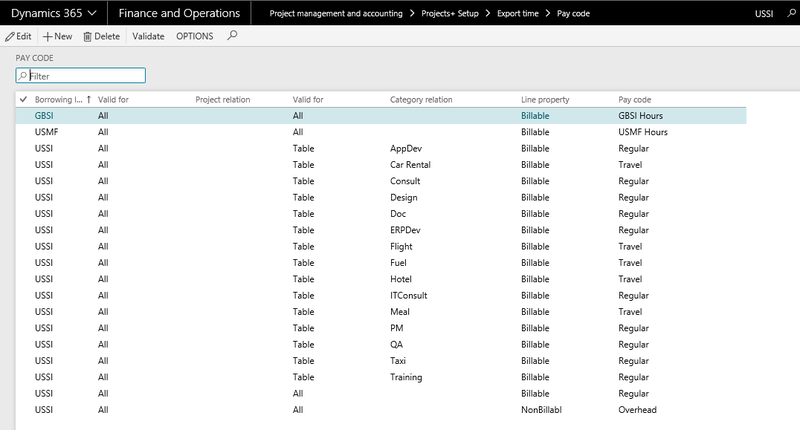 When set to group or table, the project category must be selected. This field works in conjunction with the Project category field. Project category This field is non-editable, when the option in Category code is set to All. The Category groups are displayed for selection when the Category code field is set to Group. The Project categories are displayed for selection when the Category code field is set to Table. Line property This field displays all the line properties configured in the borrowing legal entity selected for the line. Pay code This field is user entry field. For different combinations of legal entities, projects, categories and line property different pay codes can be entered. Save Saves the changes user has made on the form. New Allows to create a new combination of legal entities, projects, categories and line property for a pay code. Delete Provides option to remove the selected records on the form. Validate Allows to validate the pay code setup. There is a check on all the transactions for the specified period in the form to verify if all the transactions have the pay code defined in the setup. In the case where it is missing, the same is shown in the message details, as shown in the below screenshot. This feature will work for the users with Human resource assistant role. The user who needs to perform the required actions on the different forms associated with feature should be associated to this role.